Steve Roach is sometimes referred to as "the man in the maze" when actually the word labyrinth is much more appropriate; as the former is meant to confound while the later intended to enlighten. 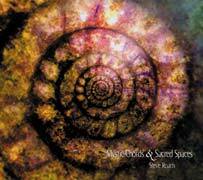 On his four album set (two double CDs) Mystic Chords & Sacred Spaces, Roach emerges from his Timeroom studio, and the labyrinthine process of realizing music, with an epic work ranging from the sensuality, warmth and fullness of a summer twilight to the contemplative desolation and barrenness of a northern tundra landscape. Repetition in Roach's greater soundworld works is not represented in the form of rhythm but in series as ever evolving separate works. 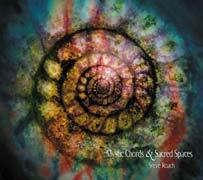 On Mystic Chords & Sacred Spaces, Roach continues to create as well as explore space. He shapes the listening experience by stretching and compressing time through the arrangement of sound, its density and timbral elements. This style of music has the ability to provide each individual with their own unique experience - even after repeated listening. The works on this album vary in smoothness - from mirror-like sleekness to oceanesque churning, from a flawless iceplanet sphere to a shimmering perfect flame and aspires to permeate the illimited distance of both interior and exterior space. The source of Roach's music is silence, in that all music rises out of this theoretical state - a state without sound that cannot be fully imagined - and into silence it will eventually return. Silence is a deep concept; as vast as that of eternity or infinity, and some understanding of silence and its relationship with sound must be grasped in order to create and contemplate this expansive music. Thoughout his many days as an artist in electronic sound, Roach has been refining his craft right along with his philosophy. With each new release, we are permitted to join Roach on the measureless miles of his journey into Mystic Chords & Sacred Spaces.